The East Coast is known for fairly mild weather in the winter, but that doesn’t mean Mother Nature won’t hit us with a big snowstorm from time to time. Snow removal in Maryland is important to keep up with. 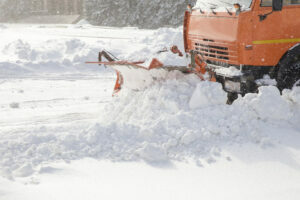 Snow removal, if you run a commercial property, is a huge issue. You need to make sure the conditions are safe so that employees and customers can safely enter your property. What types of snow removal are there? Even if snow is removed from the walkway of a business or a few parking spots are cleared, the snow still needs to go somewhere so that it doesn’t accumulate. The employees of your commercial property obviously don’t have the tools or experience for proper snow removal and snow relocation. When dealing with difficult winter weather and snowstorms, you have to account for the fact that the snow is going to keep falling. That’s why, it’s important to work with an experienced snow removal service. An experienced snow removal service like Atlantic Maintenance Group won’t just start randomly dumping piles of snow. We use our years of experience and planning to identify the safest place to pile the excess snow so that you can continue business as uninterrupted as possible. While it’s always good to have a shovel to clear a basic walkway, a little shoveling doesn’t mean that your property will be safe enough for customers and employees to navigate through. Atlantic Maintenance Group uses specialized equipment and techniques to remove snow from roads, walkways and sidewalks. Let us use our experience to help keep your businesses and commercial properties up and running when winter weather hits Maryland. If you know a storm is on the way, you can take proactive measures by applying salt and ice melting compounds to your property. While adding ice melting compounds and applying salt won’t magically stop snow and ice, it is a great preventative measure you can take to help keep employees and customers safe when they first arrive for work in the morning. Need commercial snow removal services in Maryland, Pennsylvania, Virginia or Delaware? If you need commercial snow removal, call the Atlantic Maintenance Group. The Atlantic Maintenance Group specializes in snow removal in parking lots and shopping centers just to name a few commercial companies. We work with companies as big as Target to local senior centers. Click here for a free quote today, give us a call at 410-768-4720 or contact us via our website to start planning for your commercial snow removal needs. You can also follow us on Facebook, Twitter, Pinterest, and Google+. This entry was posted on Monday, November 16th, 2015	at 11:05 pm	and is filed under Blog	. You can follow any responses to this entry through the RSS 2.0	feed. Both comments and pings are currently closed.